Due Process is one of the most interesting and conceptually challenging areas of the common law, and in recent years there has been a major revival of interest in the sheer range and applicability of the term. 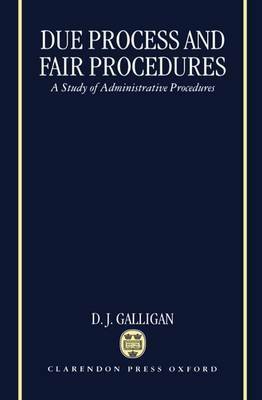 In this major new book, the author of the widely admired Discretionary Powers offers a study of the underlying principles of due process and fair procedures, and sets the discussion within a broad comparative and theoretical framework. In landmark decisions such as Ridge v. Baldwin (1968) the courts in Britain and other parts of the Commonwealth have begun to recognize the importance of procedural fairness across a broad spectrum of official powers and decisions. Principles have begun to emerge, and yet the courts have not yet developed an approach which is entirely adequate to the task. In this timely book, the author traces the development of these principles within a framework which includes analysis and critique of legal developments in the major common law jurisdictions, and which relates these developments to similar ideas under both the European Convention on Human Rights and the American Constitution. Original, scholarly and thought-provoking, this major new study will be required reading for lawyers with interests in public law, civil and criminal procedure, civil liberties, legal theory and comparative law.